For the last four years Beardy Paul and I have gone to the midlands reservoirs in May for our annual fishing trip. Unfortunately, we couldn’t make it earlier this year but finally managed to get a date in the diary for three days boat fishing at Eyebrook mid-September. As the weeks counted down the catch reports were getting better and better with plenty of fish being caught on the top of the water with nymphs, hoppers and daddies all doing well. With fly-boxes bursting with newly-tied dries and cars packed with camping gear and beer, we set off at the crack of dawn on Friday ready for three blissful days of gently boat fishing, picking off trout sipping gently at our lovingly presented dry-flies…………..well, that was the theory anyway. What greeted us was something wholly different. 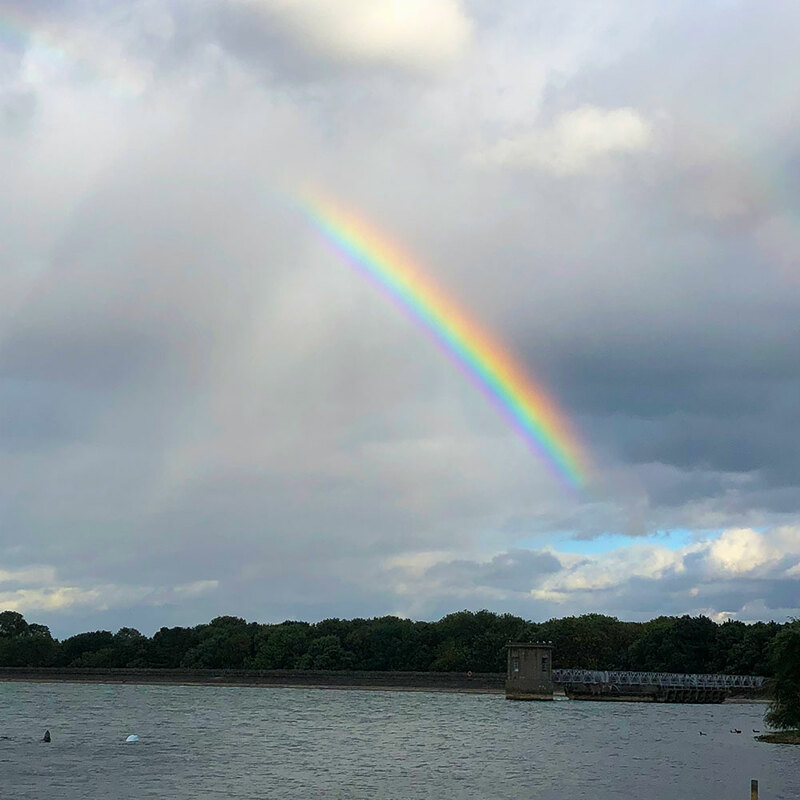 The first day saw the UK hit by the tail end of Storm Ali – 25-30mph winds with gusts a lot higher meant that the reservoir was closed for boat fishing! As we were there we decided to brave it and donned the waders. With the high winds there were few places it was possible to fish and, unfortunately, even with the waders we just couldn’t get far out enough to get into any fish. We took a break for lunch amidst a downpour and our thoughts turned to our weekend accommodation. The forecast for Saturday was looking better but it was awful Saturday night into Sunday. We decided that camping was not going to be much fun and managed to get a couple of rooms in a local lodge, conveniently close to a pub. We tried the dam for a short time in the afternoon and beardy Paul managed to hook into a passing rainbow but that was it and we decided to save our energy for the next day. I don’t think I’ve looked forward to a hot shower and warm bed more. Several beers and a pizza later and we were talking tactics ready to make the most of the next day, which could be our only good day based on the forecast! The weather that greeted us in the morning couldn’t have been better; a gentle breeze and overcast skies! We were tackled up and raring to go as soon as they let the boats out. Thinking the fish might be under the surface after the winds the day before, I started off with a midge-tip line with a couple of diawl bachs on the droppers and a black hopper on point while Beardy Paul opted for a floating line. We set up a drift from just off the tower going towards the three trees. We were into fish almost immediately with a couple falling to the hopper twitched under the surface. We re-set the drift and managed another few fish, with more taking the hopper and Beardy Paul getting into the action with a blob, Diawl Bach and cats whisker. We noticed that the fish were taking the flies just under the surface and wanted something black, with a hint of pearl, but with a bit of movement. The fishing wasn’t easy but we got enough pulls, takes and fish during each drift to keep us interested and found a fish holding area in the main bowl. I managed to bring nine to the boat and Beardy Paul managed six, falling to a range of flies including: cormorants, blobs, FABs, hoppers and cats whisker. It would have been a lot more than 6 if they’d stayed on the hook! Must have had at least 6 that day that came off. Lots of these were on the blobs or fabs, maybe something to do with the speed of retrieve or the fish just nipping at them rather than proper takes. Was still a good days action though. The forecast for Sunday had improved significantly during the day so we grabbed a couple of rooms at the local lodge again and warmed ourselves with beer in the cosy pub. Although it wasn’t raining, the wind had picked up overnight to make the conditions tricky but manageable. There was a considerable chop on the water and we knew the boats would be drifting quickly so we both set up with intermediate lines and pulling tactics. The wind was roaring through the valley from the north, so we motored up toward the island and set the first drift back towards the damn over the areas we’d caught on the day before. I started with a cats whisker on point, a cormorant on the middle dropper and a blob on the top dropper. We drifted for a while with no interest then suddenly hit a patch of water where we both had fish to the boat in quick succession, both falling to blobs. We re-set the drift and the same thing happened; fish falling to cormorants and cats whisker in the same stretch of water. We continued this drift for the rest of the morning and brought seventeen to the boat, falling to a wide range of flies similar to the day before. Eventually, the wind simply got too strong and I was having trouble back-casting. We decided to take shelter behind the island and did the last few drifts down the west bank towards the lodge, where Beardy Paul picked up another couple of rainbows on blobs. So, a tough day with the weather but we managed nineteen to the boat by 3pm. So, overall, not the dry- or nymph-fest we had been hoping for but a great weekend nonetheless with our own personal rod average of 8.5. Oddly, given the conditions it was probably our most successful weekend we’ve had as we both caught in decent numbers and consistently through both days. And as our sore arms could testify to, those Eyebrook fish certainly fight well!